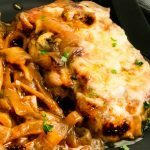 One Pan French Onion Smothered Pork Chops are tender, juicy and drenched in saucy caramelized onions and topped with melty cheese for simple, but elegant comfort food entertaining. 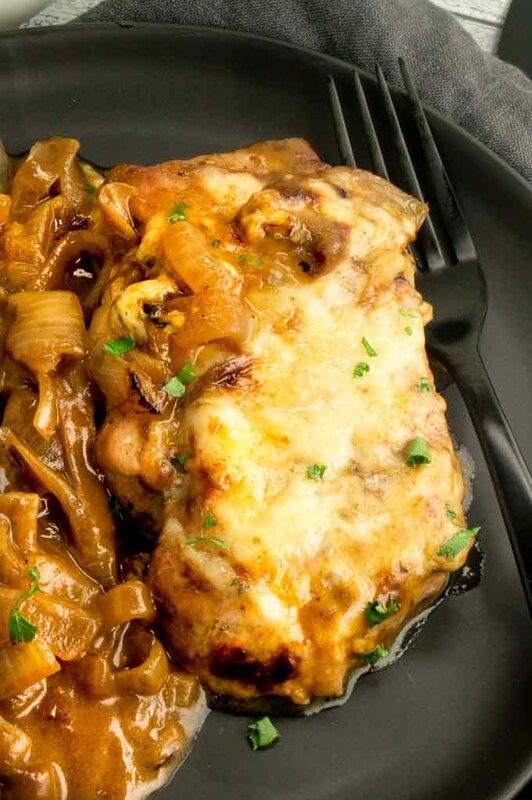 Today’s recipe for French Onion Pork Chops are a slight twist on the most popular recipe on my website ever, French onion Chicken. 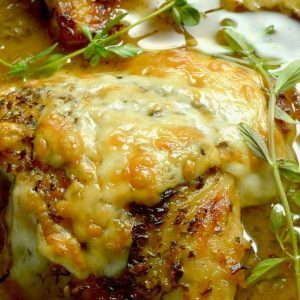 I had just gotten the nicest compliment from a reader who said how good the French Onion Chicken was and it made me want to make them again. I had everything but the chicken in the house. As Im sure you guessed I did have pork chops so I tinkered with the recipe a little. The resulting French Onion Smothered Pork Chops recipe was a huge success. It’s a great meat for comfort food entertaining. You know those meals that seem fancy to your guests, but hit the spot on warm, melty cheese, saucy tenderness in every bite. That being said, this meal is equally wonderful for weeknight meals because its comfort food that comes together so quickly! 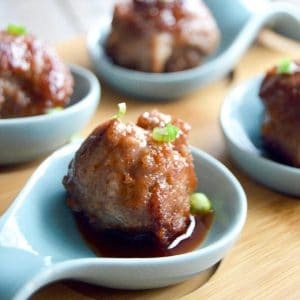 Secrets to Making Onions for French Onion Pork? Cut the onions evenly. This allows for even browning when cooking. Cut at a wider width. If you slice the onions too thin they will dissolve during cooking. I cut them about 1/2 inch wide. You can go as low as 1/4 inch, any smaller and they will disappear when cooking with the pork. Cook the onions on low heat for a long time for even caramelization and no chance of burning them. Center cut Pork Loin Chops work well. They are usually thicker, so they hold up in the cooking time and remain very juicy. I recommend 1 1/4″ thick, and would go no thinner than that. I usually recommend using meat with a bone for added flavor the bone gives. 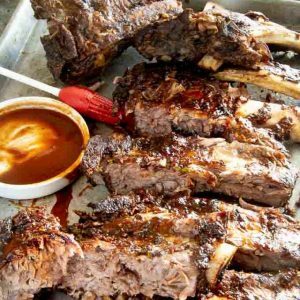 This recipe however has such flavorful onions and a velvety sauce; so while a bone in pork chop will certainly work I prefer the center cut boneless. If you want to sub a bone-in chop make sure it is a thicker cut and you will have to adjust the cooking time slightly. Sometimes a bone requires longer cooking? 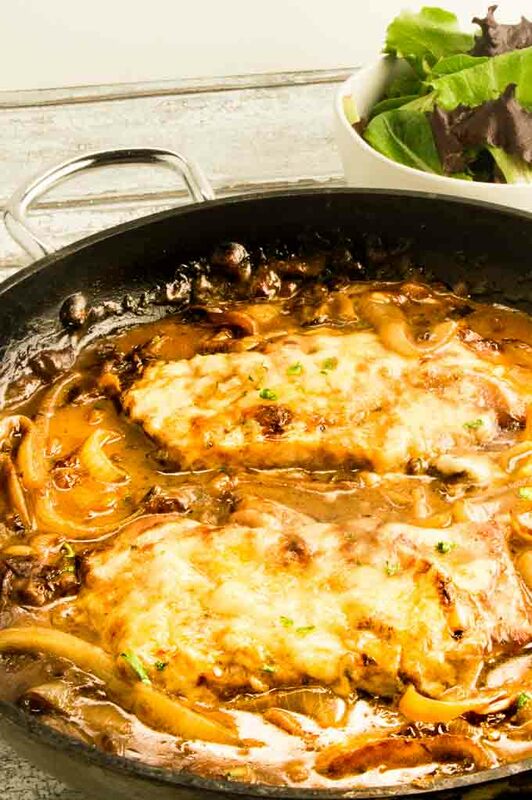 How to cook Pork for French Onion Smothered Pork Chops? Sear the pork chops in the pan for about 2-minutes per side. You’ll want to season the meat generously so when searing them they form a slight crust on the pork. This partially cooks the chops so you can cut down on the baking time. Don’t worry that the pork isnt completely cooked at this step. They will finish cooking in the oven when all of the onions are browned and you are baking them to thicken the sauce. Can Pork be a little bit pink inside? Yes! The USDA cooking temperatures have been changed in recent years to be safe to eat at 145° from the original recommendation for years of 165°. I recomend testing the pork with a thermometer to make sure it cooks to 140° before turning the oven to broil to finish browning the cheese on top of the chops. The pork will continue to cook and will remain very juicy at the lower finished temperature. What side dishes pair well with French Onion Pork? PIN THIS TO YOUR PORK BOARD OR EASY DINNER RECIPES FOR ENTERTAINING BOARD so you can find it easily when you need it. Place 2 tablespoons olive oil in pan and reduce the heat to medium-low. Add onions and cook until the onions are a deep rich brown color. About 35-45 minutes total. DO NOT TURN THE HEAT TO HIGH to cook it faster, they will burn quickly. At about 15 minutes of cooking the onions you will add the wine to the pan and continue to cook the onions. The onions will reduce down a lot. Don't worry. Its what is supposed to happen. Once the onions are nice and browned, add garlic, thyme and flour to onions and stir vigorously to combine. Continue to cook for 3 minutes. Then add half of the broth and stir and cook for 5 minutes. Then scoop out 1/3 of the onions and place on a plate. Add the rest of the broth, mustard and Worcestershire sauce and bring to a boil.The sauce should start to thicken in a few minutes. This is such a fantastic idea! Pork chops do so well in gravy, I just can imagine how well they taste in an onion gravy. *drools* And the fact that you topped it with gouda cheese! I am ALL IN! Oh my gosh, what a brilliant idea! Growing up, my Mom overcooked pork chops so never really liked them much. Once I got older, I found them to be quite boring still, until I discovered this onion/apple/cranberry sauce recipe to cook them in, and that was my go-to. Now I don’t eat pork, but looking a this is making me sad that I didn’t think of this or see this way back when! Brilliant! I can taste it. French onion anything is always super flavorful. What a great way to prepare pork chops. I shy away from pork chops normally because I overcook them and they come out try and tough. I will definitely use my thermometer with this recipe. Good to know the government changed their recommendation, I didn’t know that. The cheese and caramelized onions will really amp up the flavor and texture, looks like a winner to me. Thanks! I love a good pork chop dinner and the twist of Caramelized onions and cheesy topping sounds truly indulgent. I have a feeling we’ll be making these this week. I completely agree with cooking the pork to a slight pink interior- I grew up on dry mealy pork chops and hated them. We rejoice in the tender juicy cooking method nowadays. Oh dang, this looks so, so delicious. And that melted GOUDA on top! Holy moly, super good. My family loves the sweetness that comes out when caramelizing onions and I seem to always get stuck in a rut with pork chops so I’m 100% in love with this recipe! 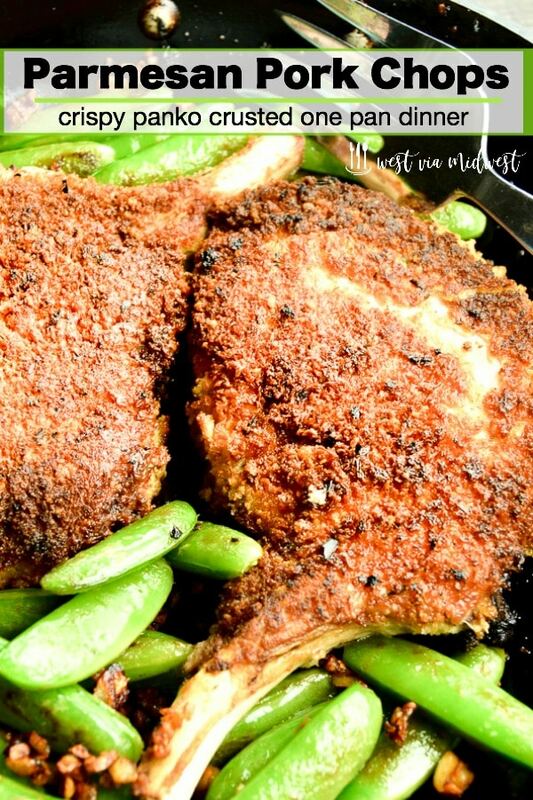 We love pork chops and I’m always looking for new ways to prepare them. These look so perfectly indulgent, and a pan that I just want to dive into, fork first! Thank you for addressing the point that properly-cooked pork can still be a little pink inside. It’s been a point of contention in the past, haha, and I keep trying to explain that once they hit 145, pork chops are done! They dry out so quickly at higher temperatures. Can’t wait to make these for dinner! 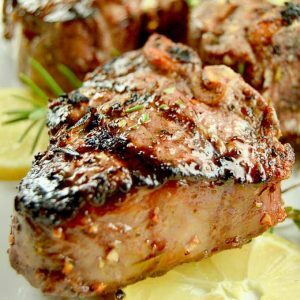 These pork chops sound fantastic! I love onions, and in the dish they are probably perfect! I love that you suggested sides for it too, makes it so easy to meal plan. 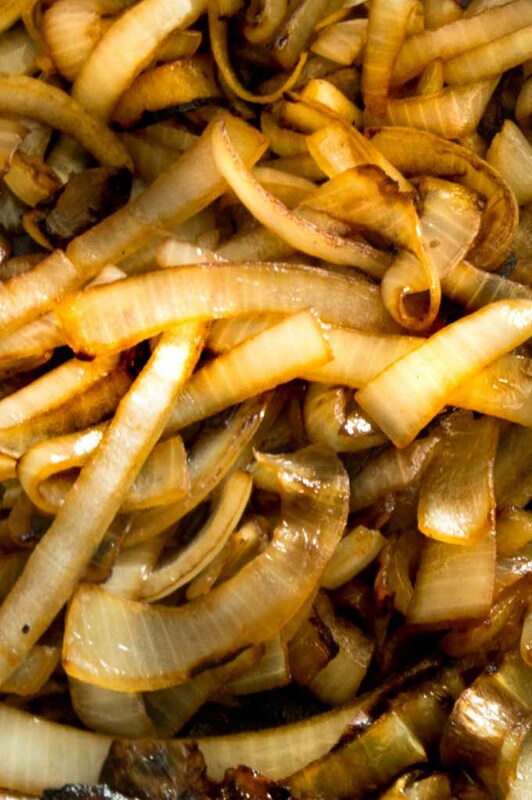 Caramelized onions are SOOO good. I love french onion soup….and PORK….so I know this would be a hit here. That sauce would be so good over rice or mashed potatoes. This is comfort food on a whole new level. Sometimes we can get some smoked pork chops…..I bet those would be awesome in this. I have printed for later….dinner is going to be so good the day I make this!! Those pork chops look fantastic! 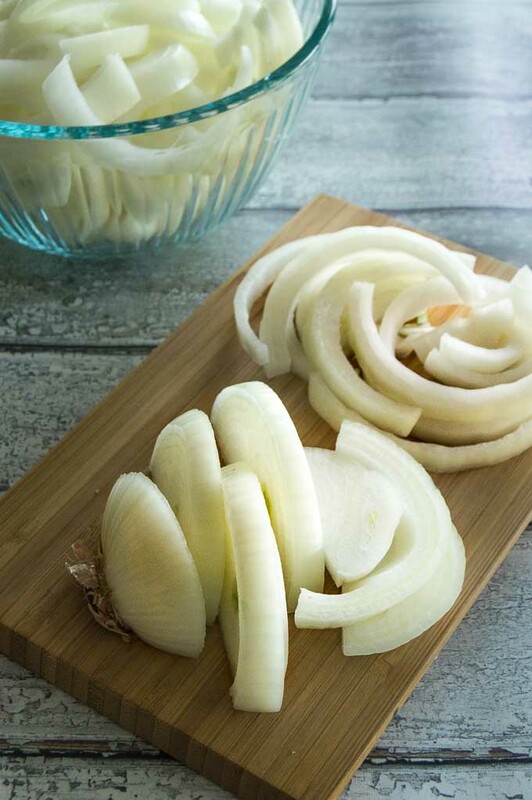 Great tip on cutting the onions on the thicker side so they don’t disappeared during the cooking and baking process. Another must try recipe for sure! Pinned!!! Your french onion chicken is a family favourite so I knew this had to tried!!!! Friday night, smoothed pork chops, a bottle of wine and a good movie. What a perfect evening! This was delicious!! And the thick cut of pork stayed so juicy. Ooooohhhh… two of my favorite things combined in one dish! Gouda on top?? Yes, please! Have pork chops in the fridge so guess what is on tonight’s menu?? ?